Hedy Fry speaks to the media at Liberal headquarters. 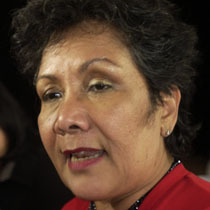 Liberal MP Hedy Fry has decided to enter the leadership race to replace Paul Martin as head of the federal party. "This great Liberal party is in need of renewal," the Vancouver MP said Thursday as she announced her candidacy. She is the third woman and the 11th candidate to join the race. Fry, who was elected in 1993, joins MP Carolyn Bennett and Toronto lawyer Martha Hall Findlay as the other two women who have so far launched a leadership bid. "I never undertake a challenge unless I expect to win," said Fry, a physician and a former president of the B.C. Medical Association. Fry has held onto her Vancouver Centre riding since unseating then Tory prime minister Kim Campbell. She has served as secretary of state for multiculturalism, but gained notoriety when she declared in the House of Commons in 2001 that cross burnings were taking place in Prince George, B.C. "We can just go to British Columbia, in Prince George, where crosses are being burned on lawns as we speak," she said then. She later apologized for the remarks amid opposition calls for her resignation. Fry said she had been given incorrect information. The following year she was dropped from cabinet during a shuffle. When asked about that incident at her announcement on Thursday, she said she named the wrong town, and that she learned a tremendous amount from the experience. She also said that most people know there is more to her than that single issue. The Liberal leadership convention will be held in Montreal in early December. Others who might enter the race include former cabinet minister John McCallum, former deputy prime minister Anne McLellan, and Ontario MP Ruby Dhalla. VANCOUVER - Maverick MP Hedy Fry officially joined the federal Liberal leadership race Thursday, saying the key to her party’s future is returning to its grassroots and reconnecting with its membership. Fry, who continues to be dogged by a controversial and erroneous comment she made in 2001 in which she said racists were burning crosses in Prince George, B.C., also used the occasion Thursday to attack the Conservative government’s child-care plan, which benefits stay-at-home parents. "Early childhood eduction, Mr. Harper, is not about parents, it’s about their children. It is an investment in our future. Our youth deserve more." Fry, who was elected to Parliament in 1993 by defeating then Conservative prime minister Kim Campbell in Vancouver Centre, added the Liberal party is in desperate need of renewal. "I’m a proud Liberal and a proud Canadian, but we all know that any organization that does not renew itself risks becoming anachronistic ...," said Fry, who has won re-election in the last four elections. Fry is the 11th candidate for the leadership of the Liberal party. Also running are: MP Michael Ignatieff, former Ontario premier Bob Rae, former cabinet minister Stephane Dion, former parliamentary secretary Maurizio Bevilacqua, former cabinet minister Ken Dryden, former cabinet minister Joe Volpe, lawyer Martha Hall Findlay, former Ontario cabinet minister Gerard Kennedy, former cabinet minister Carolyn Bennett and former cabinet minister Scott Brison.